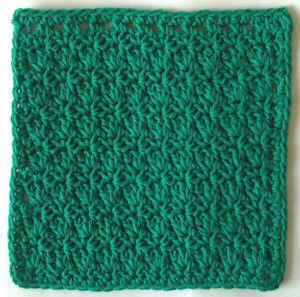 This lovely dishcloth was named after the city of Emerald Isle in North Carolina. 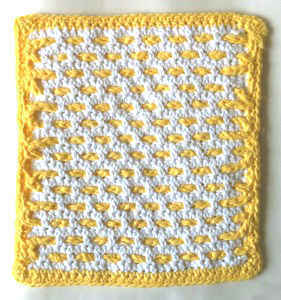 Beverly – Thank you for submitting your design for the Dishcloth-a-Day Challenge – Maggie. Crochet Hook: Size H-8 (5.00 mm) 3 dc in st or sp indicated. Shell: 3 dc in st or sp indicated. Row 1: (Right Side) Ch 33, (sc, ch 2, sc) in 3rd ch from hook (skipped ch counts as first hdc), * skip next 2 ch, (sc, ch 2, sc) in next ch, rep from * across, ending with hdc in last ch. Row 2: Ch 3, turn, [Shell in next ch-2 sp] across, ending with dc in last hdc. Row 3: Ch 2 (counts as first hdc now and throughout), turn, [(sc, ch 2, sc) in center dc of Shell] across, ending with hdc in last dc. Rows 4-15: Rep Rows 2-3 six times. Row 16: Ch 3, sc in next ch-2 sp, [ch 2, sc in next ch-2 sp] across, ending ch 1, sc in last hdc. DO NOT FINISH OFF. Rnd 1: Ch 1, turn, evenly sc around, working 3 sc in each corner; join with sl st to first sc. Finish off and weave in ends. I love Emerald Isle NC! Great little island! Went every year growing up.. I still remember the Big Oak Drive In and their Shrimp Burgers! thanks for a great reminder and pattern! What a lovely texture! I’m tempted to work this up into a baby blanket instead. 🙂 Thank you!! Um, whoa!! Did I just notice the new design of the blog – color changing tabs and whatnot?! Lovely!!! I’m really glad some of you like the stitch used. 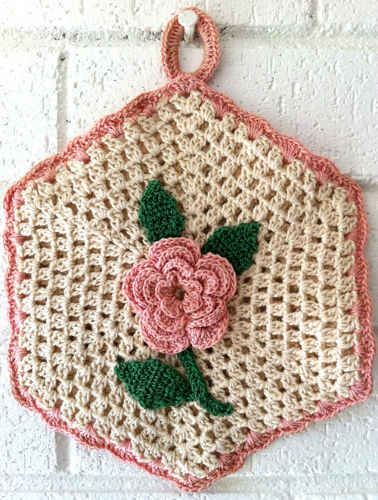 I have used it a lot for many different things like blankets, potholders, etc. This is really pretty! Would make a great blanket!